I was on my way home from work yesterday when I passed this small eatery at EDSA Boni, it's always a habit to me whenever I'm near the vicinity to have a glimpse on the displayed menu for anything worth craving. I exclaimed as Bilo-bilo greeted me and very inviting. I remember in my previous work (after Singer) every time we dined at the nearest Mang Pepe, Bilo-bilo will always be in the menu. A truly mouth-watering native Filipino dish and is one of my favorite sweet snacks. Typically speaking Bilo-bilo is a combination of ripe banana (saba), sweet potato (kamote), jack fruit (langka) and sago as the main ingredients but this varies depending on how creative you are on presenting the dessert. In Negros we call it Lugaw (imagine my surprise the first time I had the taste of Lugaw here in Manila, it comes with a chicken, lol), but instead of the powdered rice we used the real rice (malagkit) and like the Manila style it consists of different sliced ingredients. I remember as a kid when my birthday comes mother would always include Lugaw or Bilo-bilo in the menu. See, I felt home everytime I'm eating Bilo-bilo. Cooked in coconut milk extract (gata) thus Bilo-bilo also called "Ginataan" in Tagalog with glutinous rice balls, ripe bananas (saba), sweet potatoes (kamote), ube, cassava, jackfruit (langka) and sago making the combination colorful and attractive and is best serve as an afternoon snack or for an after meal. 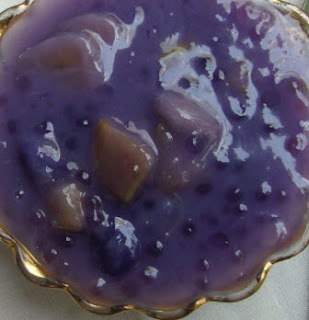 Bilo-bilo is easy to serve just combine sweet potatoes, ube and cassava in a saucepan with enough water until cooked. 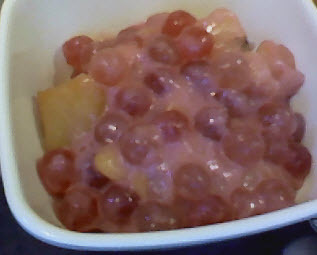 Add sago and glutinous rice balls until transparent. Add bananas, langka and coconut milk, wait till it boil and add sugar. When done, pour over coco cream and voila serve it while it's hot. The only seems hard about making a Bilo-bilo is the making of the glutinous rice balls. Forming those sticky things into a ball is kinda tough but in a way it's also fun. So, without further ado, let's get ready and well doing the Hell Kitchen featuring Bilo-bilo, here's the ingredients. Now, serve this hot to eight (8) of your love ones. You have some interesting info posted here. I'll bookmark your site and check again here later.